Incompatible with life. A vegetable. Destined for a life of suffering. Often these are messages that health professionals deliver to parents or soon-to-be parents of a child with trisomy 13 or 18, chromosomal abnormalities that cause marked developmental delays, among other health issues such as heart defects. But online support groups and social networks paint a different picture, according to a study recently published in Pediatrics. This study surveyed parents of children with trisomy 13 or 18 who belonged to Facebook groups or other online support groups for the trisomies. Out of 503 invitations sent, 332 questionnaires were completed, providing data on a total of 272 children. After receiving a diagnosis of trisomy 13 or 18 for their child, many parents reported that their healthcare provider presented pessimistic views about their child’s future and the implications for their family. Parents reported being told by some providers after their child’s diagnosis that their child was incompatible with life (87%), would live a life of suffering (57%), would be a vegetable (50%), would live a meaningless life (50%), would ruin their marriage (23%) or would ruin their family (23%). Despite this, parents surveyed had many positive perspectives on raising their child with trisomy. Of parents with living children, 99% reported that their child was happy, and 95% claimed they were able to communicate with their child and respond to his or her needs. Of parents whose children had died, 89% reported the overall experience of their child’s life as positive and 98% reported that the child had enriched their life. Some aspects of family life seemed to be enhanced as well. 82% thought that their child with trisomy 13 or 18 had a positive effect on his or her siblings and though 3% of marriages dissolved after the diagnosis, 68% of parents surveyed reported a positive effect on the spousal relationship. This next finding may surprise providers: 83% of all parents surveyed said that they would continue a subsequent pregnancy with trisomy 13 or 18, or decline prenatal testing at all. When I first learned of trisomies 13 and 18 in medical school, I was presented with a pretty hopeless view of both conditions. Lethal, they taught us, with high risk of fetal loss and most children not making it past their first birthday. In an effort to learn more, I searched online and found some websites for trisomy 13 and 18 support groups. After what I had heard in class and read in the books, I didn’t expect to see what I saw: picture after picture of beautiful, smiling children—many who were much older than one year. 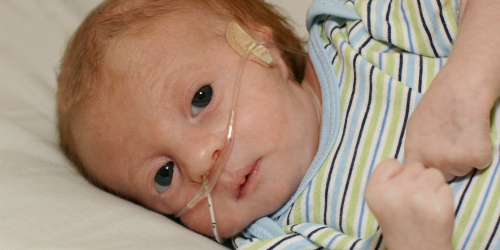 A diagnosis of trisomy, whether prenatal or postnatal, is difficult on parents and families. It is our duty as medical professionals not to give false hope–trisomies 13 and 18 have very real and serious implications for a child’s health, development, and long-term survival–but also not to present unnecessarily negative views about the life their child may lead. In this study, 40% of children lived past a year of age. This may be in part because parents whose children live longer are more likely to join social networks, but it shows that each child is unique and their course is often unpredictable. Physicians should provide a realistic assessment of what parents can expect, and allow them to make decisions about their child without judgment. Although this study is not representative of all families affected by trisomy 13 or 18, it nevertheless presents crucial information that physicians should take into account when communicating with parents and caring for their children. As a future pediatrician, I found this study valuable in elucidating the way parents view their children and their lives. One of the most important sections of this study discusses parents’ interactions with health providers. 37% of parents who wanted interventions for their child felt judged by clinicians. Some parents in the study even reported their providers making insensitive comments such as referring to their child as an “it” or “that,” or a “T13” or “T18,” giving the impression that they did not view the child as a valuable human being, but rather a genetic diagnosis. Behaviors that parents appreciated included referring to the child by name, offering to take pictures, and describing the normal aspects of their child. Unless they have experienced it, doctors don’t know what it’s truly like to raise a child with trisomy. It’s important that physicians be aware of studies like this that shed light on parents’ points of view and the many possible outcomes of a trisomy 13 or 18 diagnosis, starting early in their medical training. This study is a testament to the power of social media. Social networking and online support groups can be a great resource for parents of children with trisomy 13 and 18, revealing both the positive aspects and the challenges of raising such children. Health providers should consider referring parents to such groups in the face of a diagnosis. Online networks can provide emotional support, perspectives from real families, and information parents need to make the best decisions possible for their child.